When not executing commissions for portraits, Thorvaldsen almost always took his motifs from the Bible or from ancient mythology. Meanwhile, a small number of his works were not so directly linked to literary sources, and of these the “Shepherd Boy” is the most important. Nevertheless, the style of the sculpture is so much in accordance with antiquity that we do not confuse him with an Italian boy from Thorvaldsen’s own time – much less our own. He sits there as though he was a brother of the mythological shepherd boy Ganymede, who was taken up to Olympus by Jupiter’s eagle. 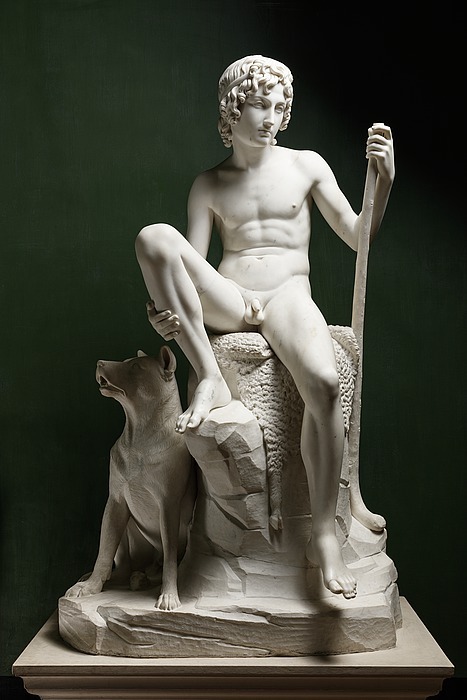 In other words, Thorvaldsen, the classicist, has been able to envelop the shepherd boy’s naked body in an invisible – yet effective – veil of classicism.